The second world war was the most catastrophic war in human history. The origins of the second world war in Europe are complex and controversial. The following article is a list of ten books that provide different perspectives on the root causes of the second world. In these works’ the authors offer a new or influential argument on the decision and policies that resulted in the second world war. The range of the reasons for the cause of the WW II include the western democracies policies of appeasement, German Nationalism. The National Socialist Ideology, economic rivalry and in the character of Adolf Hitler. A.J.P. Taylor. Origins of the the Second World War (Fawcett Premier, 2nd Edition, 1966). The eminent British historian believed that politicians such as Hitler and Mussolini were only responding to events and were opportunists who exploited the situation in 1930s Europe for their own national self-interests. At first British and French opinion accepted this, but as Hitler became more ambitious, it was no longer possible for the western democracies to tolerate German expansionism. Public opinion in Britain changed and wanted a more proactive response to Hitler. This led to a change in British foreign policy, which became increasingly hostile to Germany. It directly led to the British government issuing an ultimatum to Germany over Poland and this resulted in the declaration of war in September 1939. Overy argues that Germany was not the ultimate cause of the war. Rather it was a result of a failed international system. The British and French Empire were in decline and they were faced with rising powers in Europe such as Italy and Germany. American isolationism meant that it was reluctant to help the British and Empires to resist Italy and Germany and meant that international relations were fundamentally unstable. The international order, which had not recovered from the First World War, was easily destabilized by Hitler and this led to Europe once more descending into a terrible conflict. David Cameron Watt. How War Came: The immediate causes of the Second World War (Penguin/Random House, 1989) Watt shows Hitler to be a gambler, who embarked on a reckless foreign policy in order to win territories for Germany. He did not wish to go to war, but he was determined to expand Germany’s borders and recover all the lands lost under the Treaty of Versailles. Hitler eventually unintentionally provoked France and Britain, by invading Poland and this led to the outbreak of a general war in September 1939, which is something he did not want. Based largely on Neville Chamberlain's, the British Prime Minister’s perspective. This book describes how were it not for Chamberlain's policy of ‘appeasement’ which sought to prevent war by agreeing to Germany’s demands on issues such as the Sudetenland, World War II might have been avoided. Ruggerio showed that Chamberlin’s policy only made Hitler to seek more territory. Eventually, Chamberlin recognized that Hitler would make continual demands and this led him to change his policy and when Hitler invaded Poland he declared war and this was to lead to the second world war in just over twenty years. Jonathan Wright. 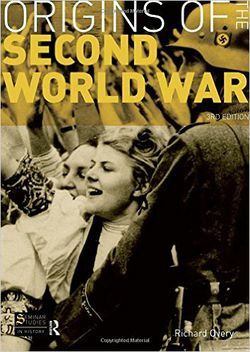 Germany and the Origins of the Second World War, Palgrave MacMillan (2007). 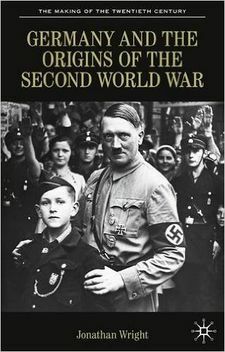 This book firmly blames Adolf Hitler for the start of the Second World War. He was eager to create a racial empire in Europe, which the Germans as the ‘master race’ would dominate. Wright believes that Hitler had to persuade and even mislead the Germans into entering into a war with their neighbors. Many Germans, after the First World War were unsure about going to war. Hitler’s by exploiting German nationalism was able to win enough support to embark in an aggressive territorial policy and this provoked the western allies to declare war on Germany in September 1939. Keith Eubank. The Origins of the Second World War (1969). This book asks a series of questions as to why the western democracies allowed Hitler to become so strong and to break international treaties. The author finds that the west underestimated the threat posed by Hitler to peace. In this work the author believes that the western governments adopted the policy of appeasement because they were so reluctant after the First World War to fight another international conflict. The appeasement of Hitler was initially popular in both France and Britain and the democratically elected politicians were only following their electorates wishes. The policy of appeasement was ultimately to fail and instead of preventing a war, helped to start another world war. This book argues that the ultimate cause of the second world war was the National Socialists Party's seizure of power. Once Hitler came to power, war in Europe was inevitable given his ideology and personality. The Treaty of Versailles was bitterly resented by many ordinary Germanys, especially the loss of its colonies and as a result they were intensely nationalistic and this led them to accept and support the National Socialist government. This together with the impact of the Great Depression allowed an extremist, Adolf Hitler to seize power and to start an international conflict in Europe. Hehn in this work argues that economic reasons are as least as crucial in causing the second world war as military, political and ideological factors. After the Great Depression, European nations were desperate for markets for their stricken economies. This led Hitler to see more territories and motivated Mussolini to seek more colonies in Africa. This was very destabilizing and greatly contributed to the outbreak of war in Europe in 1939. Gordon Martel. The Origins of the Second World War Reconsidered, Rutledge (1996). This work is an updating of A.J. P. Taylor’s classic work on the causes of the second world war. Based on the latest research the work critically engages with Taylor’s arguments. The work consists of twelve essays by distinguished scholars, who argue that Taylor’s theory is too simplistic. The twelve essays offer a range of opinions on the reasons for the war, with a particular focus on the policies and character of Adolf Hitler and the failure of the western policy of appeasement. Hillgruber, Andreas. Germany and the Two World Wars, Harvard university Press translated by William C. Kirby (1982). This page was last edited on 15 April 2018, at 12:28.